The TBS Comfort Text is a licensed reprint of the Collins Iona Clear Type Octavo from 1957. 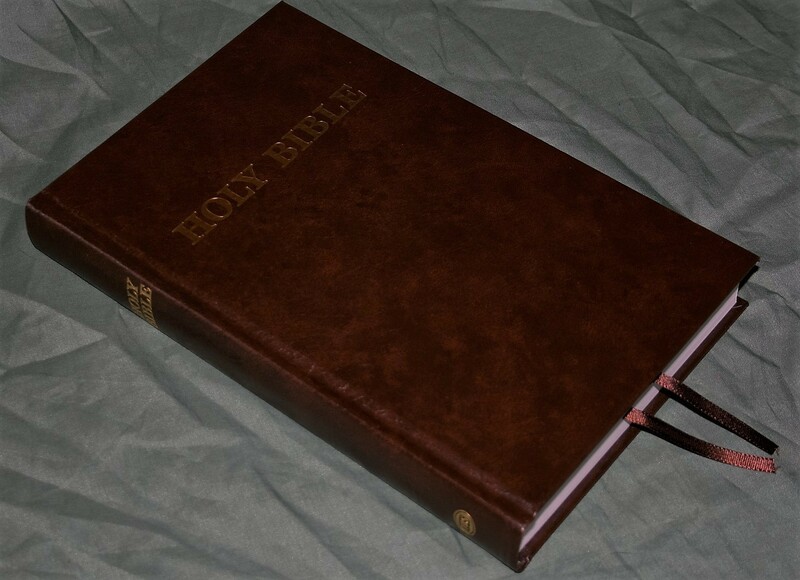 It’s a text-only KJV in hard cover with 2 ribbons. It comes in black or brown. I’m reviewing the brown which has two brown ribbons to fit the color scheme. ISBN: 9781862283473. 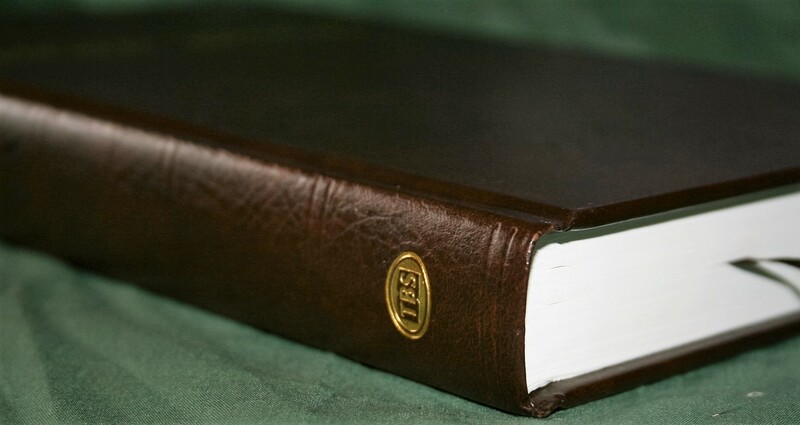 The Comfort Text is a hard cover edition that’s covered in brown vinyl. 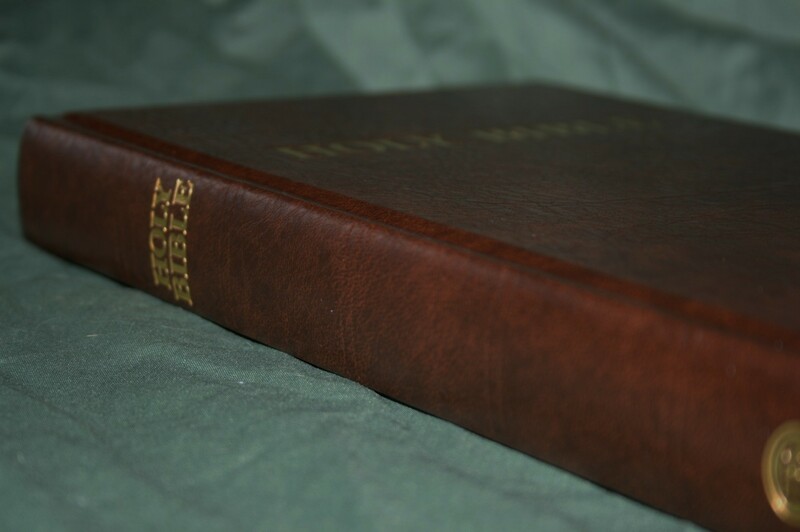 The brown is about a medium-dark with gold lettering stamped into the cover and spine. The vinyl provides a nice grainy texture. I love the way it looks and feels. It’s sewn and includes decorative head and tail bands. 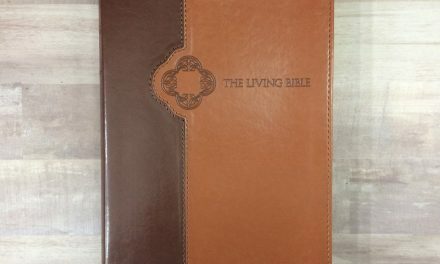 This is a unique size for a Bible. At 9.75 x 6.5 x 1 it’s thin, narrow, and tall. 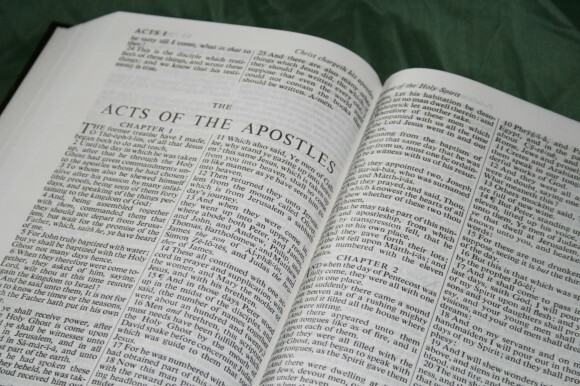 One advantage of this is you don’t have to turn pages as often for preaching and teaching. It fits the pulpit better and leaves enough room for your notebook. 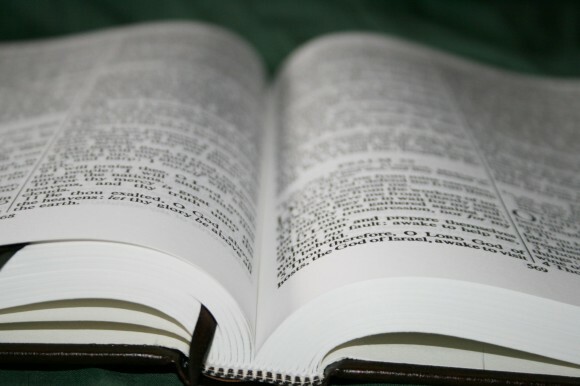 Shorter Bibles don’t make as much use of the pulpit for the vertical measurement. 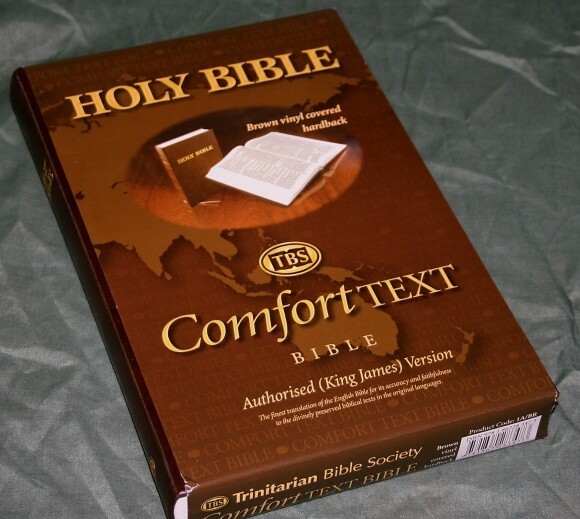 So you could say the Comfort Text make more efficient use of the pulpit space. 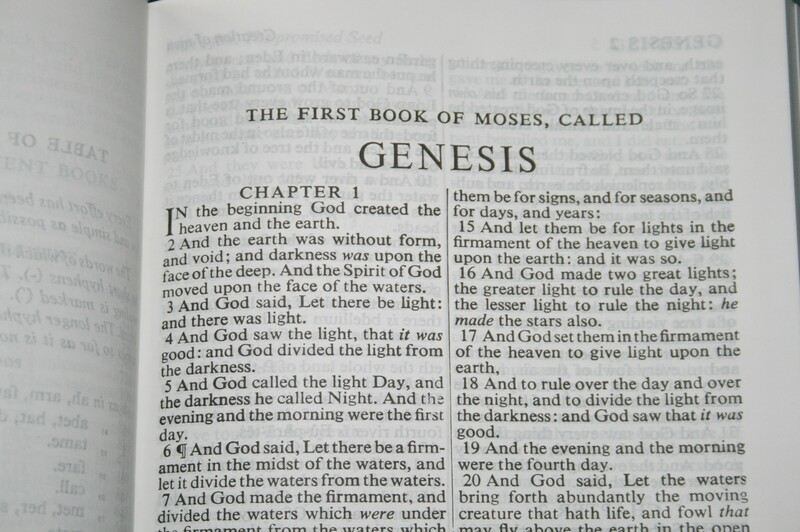 The paper is Bible paper, which is 33 gsm. This is some of the most opaque paper I’ve seen. I haven’t written in it but I think it would be good for any kind of marking or highlighting. There aren’t any pages for notes but you can write in the outer margins and in the footer if you want. The text is set in a double-column verse by verse format. 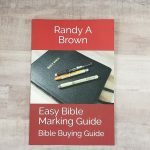 The header contains the book name and chapters that appear on that page, and a page summary. 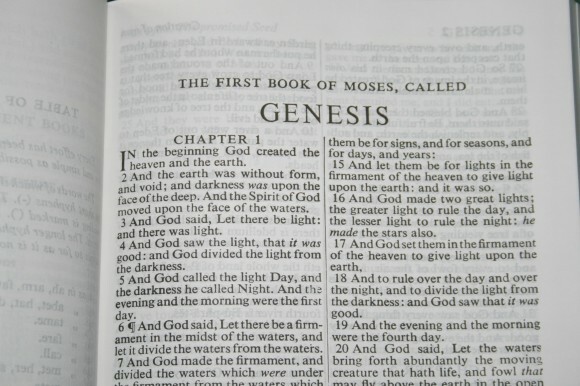 It’s a text-only edition, so the text doesn’t have to share the page with anything. I prefer this for my reading Bibles because it places the text front and center with no distractions. The font is 10-point black letter. It has self-pronunciation marks for some of the most difficult names. There is a guide in the front to show how the markings should be pronounced. I’d call this a semi-bold font. 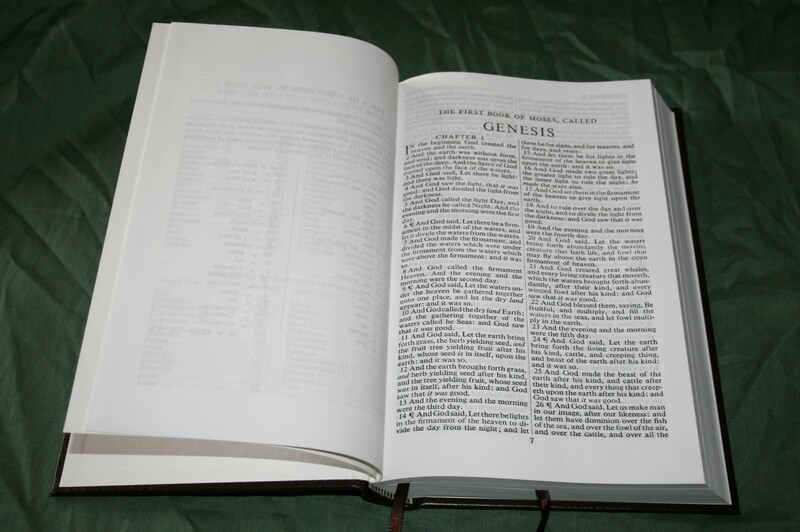 The typeset is easy to read and is consistent from one page to another. Supplied words are in italics. I prefer this for study and I don’t have any issues with reading it. So if it’s an either or, I prefer having the italics. At 2.5”, the columns are much wider than normal and has around 40 characters across. This helps give the text a lot of breathing room so it doesn’t feel crowded. The text hyphenates words rather than having awkward spaces or words that are too close. There’re aren’t a lot of hyphens, so this doesn’t feel overdone. The verse numbers are indented. 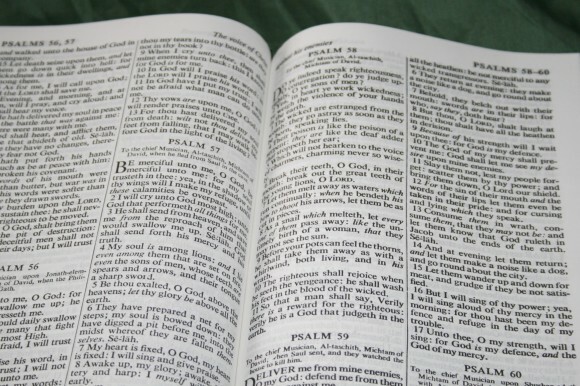 I like this because it makes finding the verses much easier. Since this is a setting from the 1950’s it doesn’t look as sharp as digital fonts such as those found in the Windsor, but it is bold and it does live up to its name in being a text that’s comfortable to read. I can read it easily in my badly lit house with no trouble at all. 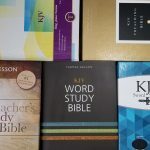 It’s also easy to preach and teach from. I would like to see a wider inner margin. The text in the inner margin bends down into the gutter and sometimes is too close to the gutter to read easily. 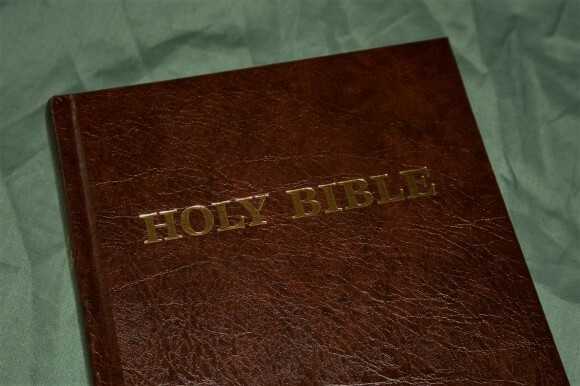 This would make the Bible wider, but it wouldn’t have to be much. Another option is to shift the text toward the outer margin by .25”. The outer margin has .5”. 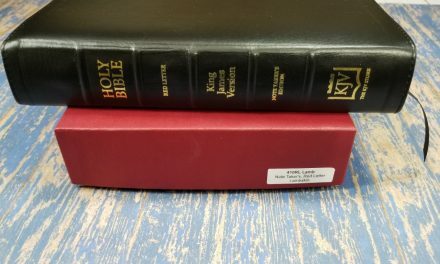 The Trinitarian Bible Society is a non-profit organization that supplies the Scriptures for free to those that can’t afford them. 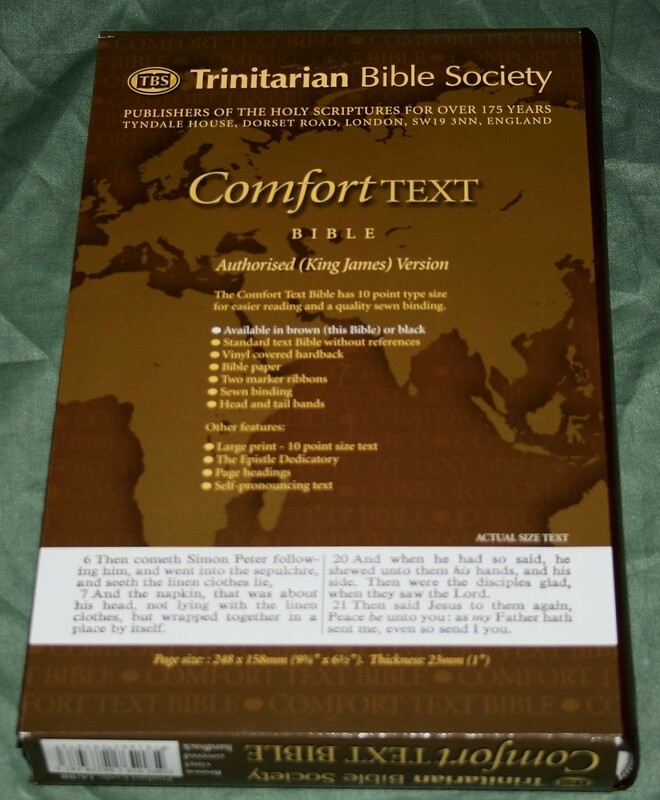 Learn more at their website: TBSBibles.org, and you can buy the Comfort Text directly from TBS: Comfort Text. The TBS Comfort Text is a fine text-only KJV at a fine price. 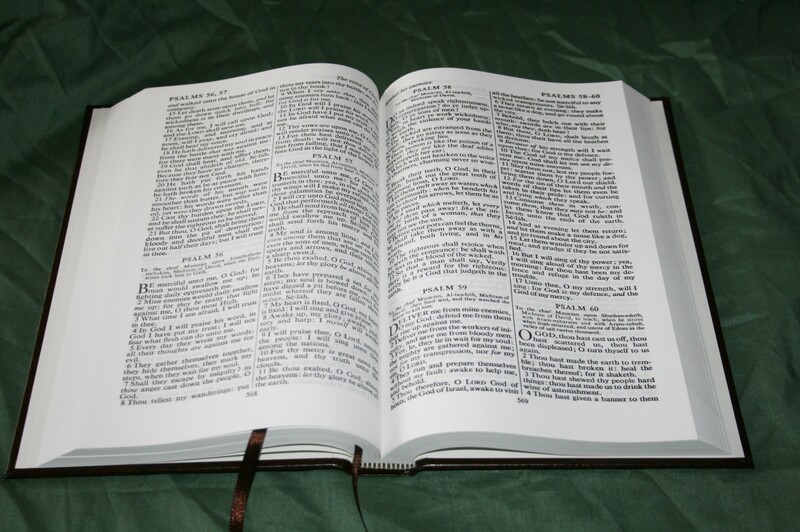 The text is large and bold, making it very easy to read and preach from. The paper is extremely opaque and has so little show-through that I don’t even notice it. 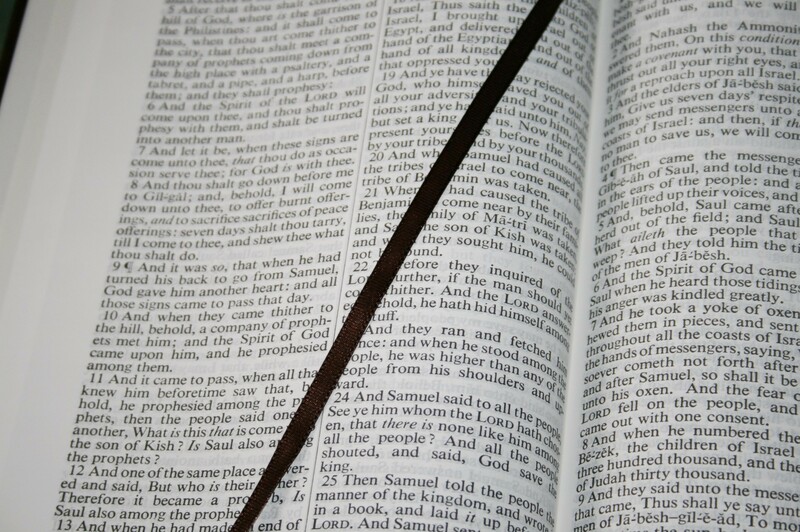 It’s taller than the average Bible, but it’s thin and doesn’t feel like a large Bible. 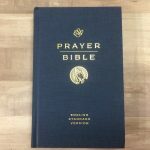 The size might keep me from using it as a carry Bible, but it’s a good choice for reading and preaching.